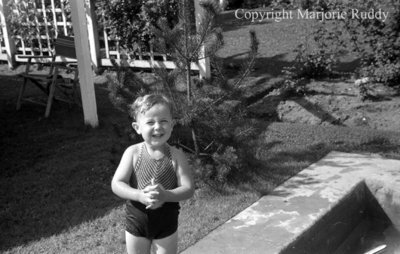 A black and white negative of Donald Wilson Junior standing on the edge of a swimming pool on August 20, 1938 in Whitby, Ontario. In this view he is smiling at the photographer and holding his hands together in front of him. A small spruce tree is visible behind him. Donald Wilson Junior, August 20, 1938, Marjorie Ruddy. Whitby Archives, A2013_040_861A.